Being an emcee is quite a big task. You’ll be hosting the event, running the show, and coordinating all the speakers. And if you haven’t done it before it can be very overwhelming to prepare. That’s why we’ve put together this easy-to-follow guide to show you what you need to organize and what you can do to emcee like a pro at your corporate event. 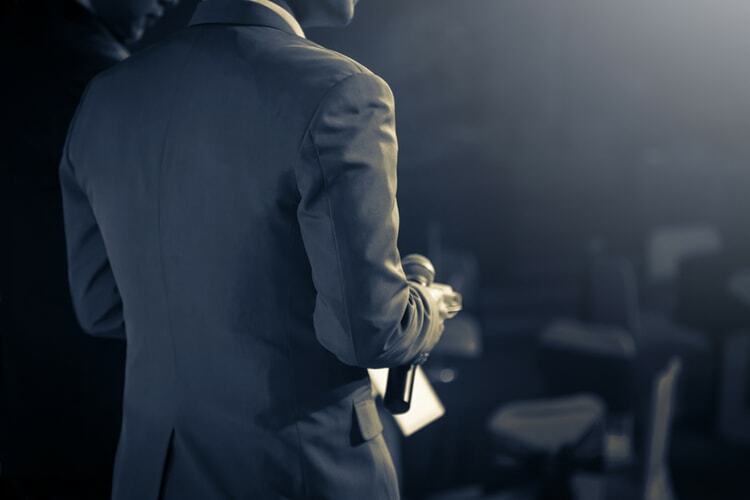 In most cases, your role as an emcee will be to ensure that the event runs smoothly from beginning to end. It includes welcoming everyone to the event, outlining the agenda, introducing the speakers, and keeping the flow going from topic to topic. But before you start to prepare your talking points, you should know all about the purpose of the event. Does your company want to motivate current staff or is this a client event? Find out what the objective behind the event is first and then build out your platform from there. As the Master of Ceremony, you’ll need to keep everything moving during the event, so it’s essential to plan the schedule accordingly. Make sure you give enough time between speakers for transitions and breaks and know when things are supposed to start and stop. That way you’ll be able to keep the speakers on topic to keep on time and have enough talking points to fill up the amount of time you’ve arranged for each session. Although you’re not required to be the star at a corporate event, you are required to be entertaining and work the crowd. That’s why it’s crucial to know who the audience is and what topics interest them. That way you can keep them interested. Just remember to deliver content that is respectful, engaging and that provides value. As you’ll be introducing the speakers and potentially leading discussions, it’s essential that you learn about each and every one of the speakers — who they are, how to pronounce their name, what company they work for, their position, and a bit about their history in the industry. You should also send each speaker your agenda and content notes, so they know their role in the event as well. It’s important that you practice your delivery and the content. Not only will this help you to stay on time during your event but it will help to ease your nerves come event day. It’s also beneficial to talk to the venue coordinator to set up practice time for you before the event where you can get up on the stage, hear your voice through the microphone and practice your tone and delivery. Whenever you’re public speaking, you need to be prepared to improvise in case something goes wrong like a speaker fails to show up, the microphone breaks or the visual equipment doesn’t work. So make sure you book the right venue (with staff that can help if you need it) and prepare some extra content and ways to entertain the audience that you can use in case the occasion arises. If you’re looking for the best venue to emcee like a pro at your corporate event, look no further than Centurion Conference and Event Center in Ottawa. We have everything you need from in-house catering, a 14,000 square foot facility that can be customized, including high-speed wireless, business services and complimentary parking. Find out more today!